Doris was born on December 22, 1926 in rural Grundy Center, the daughter of Marcus D. and Minnie (Kruse) Meyer. 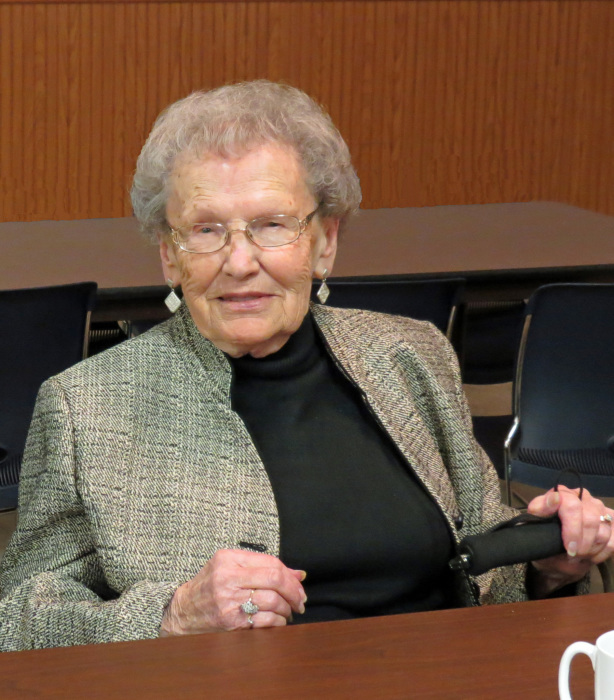 She graduated from Grundy Center High School in 1945. On April 17, 1946 she united in marriage with William “Bill” Kuhlman at the Little Brown Church in Nashua. To this union two children were born. Doris was a member of Colfax Center Presbyterian Church for many years. Following their marriage, Doris worked hand in hand with Bill farming together for over 70 years. In her free time, she enjoyed gardening, sewing, baking and spending time with her family. Doris was well known for making homemade cakes from scratch and spent countless hours putting the final touches on wedding cakes, birthday’s and other special occasions. Doris is survived by one daughter, Linda (DeeGene) McMartin of Grundy Center; one son, Darrell (Tonie) Kuhlman of Alice, Texas; seven grandchildren; 13 great-grandchildren; two step-grandchildren; two sisters, Wava Jean (Jake) Hemmen of Grundy Center and Anna Mae Klaassen of Holland; two sisters-in-law, Jeanette (Martin) Broer of Iowa Falls and Margie Kuhlman of Holland. She was preceded in death by her parents; husband Bill on January 23, 2017; one grandson, Clinton McMartin; one brother, Merle (Agnes) Meyer; two sisters, Marcella (Lyle) Doak and IvaDell (Virgil) Getting. Abels Funeral & Cremation Service, Engelkes Chapel in Grundy Center is assisting Doris's family.